Unusual pictures for you to see that snow and Tenerife holidays in the sun go hand in hand, indeed. All shots were taken around lunch time in Winter in Puerto de la Cruz by its garden beach. In fact, there couldn't be a better picture than the one above to give credit to the superb Tenerife weather conditions. 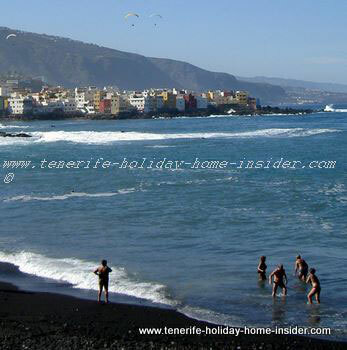 Click the photo to enlarge to spot three paragliders sailing on the horizon of the fishing hamlet Punta Brava of Puerto de la Cruz of the island of Mount Teide , while a few adults are frolicking in swimming costumes in the water near the edge of the deep blue ocean. 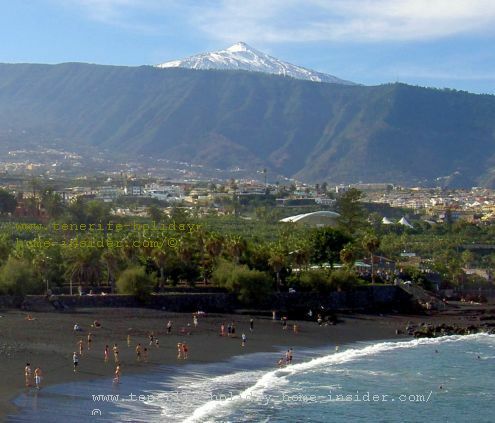 This is a most beautiful scene of winter holidays in Tenerife. However, it is one of unusual pictures, as it is rare to see Spaniards or Tenerife tourists bath in the ocean by noon or in the early afternoons. Reason being is that most are taking lunch at this time. Also, many holiday makers prefer to swim in their hotels. Most hotels of Tenerife have heated swimming pools to spoil you. If the above people with their water fun were turning around, then they would notice the paraglider beach landing, virtually five minutes from them at Castillo San Felipe. That spot next to Playa Jardin isn't only good for free parking for the sportsmen with their gliders but, also for others. 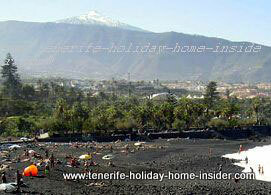 Tenerife with its Winter sun is amazing and popular, as the picture beside clearly shows. Then, temperatures will always be below 20 degrees, unless it's a rainy day which happens in that season. 24 degrees are rather the norm on sunny days between October and March. You can easily sit dressed lightly in the noon sun. This is portrayed above by the locals. They enjoy themselves on top of a Playa Jardin beach wall, while the young man is in his swimming costume. The majority of people on the same beach are also in swimsuits, of course. An elderly man made himself comfortable by rustic stairs and contemplates the Atlantic waves on Playa Charcón Puerto de la Cruz. The steps are framed by volcanic boulders which often land on this seashore from the mountains by floods. The natural rocks and staircase were part of César Manrique's original landscaping plans. Young guys by the pathway are most probably on the look-out for friends riding the ocean waves on this popular beach that's not suited for surfing every day. Hopefully, my photos which often differ from most others online are proof that you will never get bored on Playa Jardin. 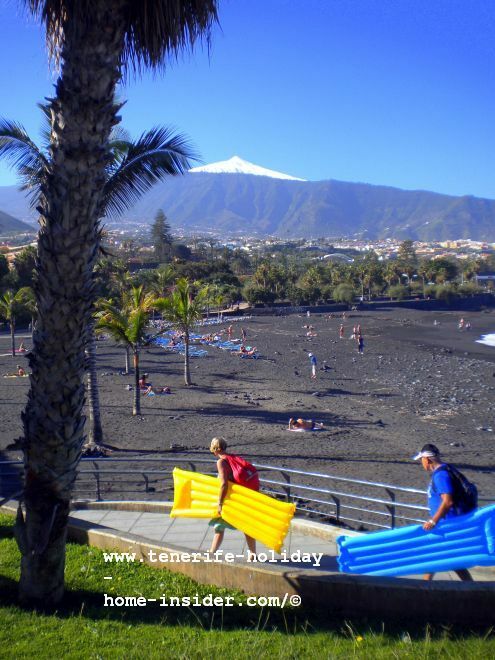 The almost odd picture garden beach beside again emphasizes climatic contrasts by the first Tenerife resort. Meantime, it only gives an idea of this phenomenal island called Tenerife where everything is possible after a mere four and a half hour journey with cheap flights from London UK. How travel to Tenerife fast? 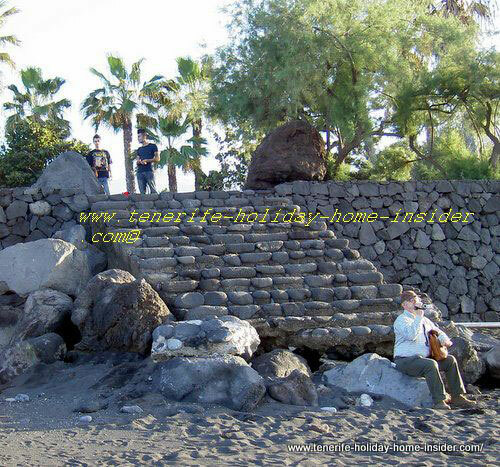 From unusual pictures back to cheap flights Tenerife wich make extraordinary photo shoots of Tenerife possible. An interesting article about what it takes to become more unique, or unusual, as it's not that easy.